For Today’s Card we’re introducing the 2 Rummy Labyrinth Rares and 2 SGR cards from the 3rd Character Booster “Rummy Labyrinth Under the Moonlight” (which goes on sale March 3rd). Today, the 3rd Character Booster “Rummy Labyrinth Under the Moonlight” goes on sale! It includes cards from 《Pale Moon》 and 《Granblue》, which are used by the idol unit, Rummy Labyrinth, in the animated series, and those cards are charming cards that enhance their clan’s respects decks. 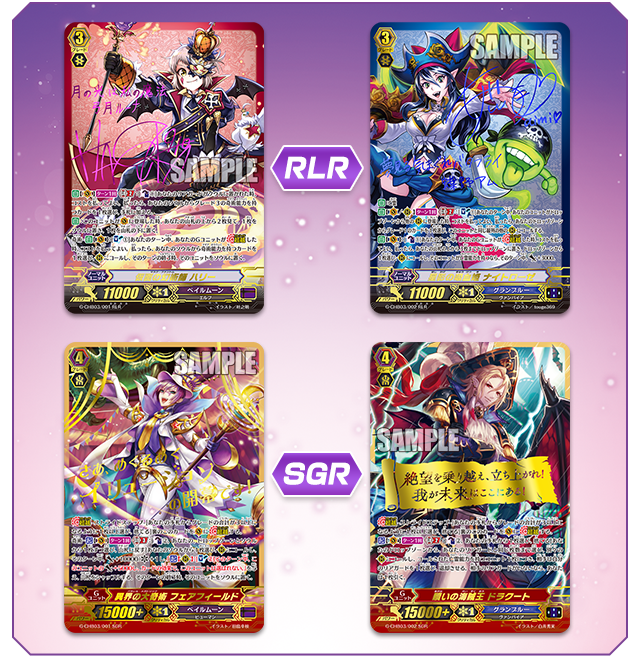 Also, the luxurious SGR Cards included are “Parallel Megatrick, Fairfield” and “Pirate King of Redemption, Dragut”, but there’s also the super luxurious Rummy Labyrinth Rare, both of which are signed by their user’s respective voice actresses, Yumizuki Luna’s VA, Kudo Haruka, and Chouno Am’s VA, Aimi! If you get your hands on any of these you’ll be super lucky! And feel free to put them in your deck and use them by all means! Starting March 6th, we’ll begin introducing cards from the Legend Deck “The Blaster “Aichi Sendou”” and “Fighter’s Collection 2017”! Be sure to enjoy them!